Supreme Deck, Lake Orion Michigan’s premier deck builder and contractor, has been providing homeowners with exceptional services and products since 1991. Our experienced crews have pleased countless customers by transforming backyard outdoor living space with our custom wood and composite decks, gazebos and sun-rooms. Every home deserves to live up to its potential and we are the deck builder of choice stepping up to meet this challenge. Each project is unique. Together with the homeowner, we will design a deck or outdoor structure that will bring you satisfaction for years to come. Supreme Deck building contractors in Michigan, offer a wide choice of building materials that we can offer. Our commitment to furnish the highest quality at the most affordable price is still there after all of these years. Home owners are fast picking up on the growing popularity of home improvement. One of these is the installation of custom decks which functions for many different purposes. Decks are ideal home additions since they can be alternative function areas for varied activities, such as social events or family activities. Aside from this, there is the effective elimination of disorganized indoor surroundings since most play and fun activities are implemented outdoors. There are many general contractors and even more “construction companies” in Lake Orion, but none can provide the single focus on your backyard the way we can. We don’t do kitchens, bathrooms or any interior work. We don’t believe in the “Jack of all Trades” concept. We believe in specializing in one trade. We have the ability to build a deck for you and to make sure it gets sealed properly for you. You do not have to hire one company to build your deck and another to seal it. Deck building and construction is what we specialize in for Lake Orion. Homeowners realize that by expanding their living space to the outdoors, they are making an investment that will not only increase the value of their home, but will provide a haven for relaxation, leisure, and entertainment. A deck does exactly that. Because this decision is so important, homeowners desire to work with someone they trust will maximize their home’s value. That is why Supreme Deck is determined to provide you with the best possible service available.There are many material options on the market available to homeowners looking to begin the deck building process. Some of these include pressure-treated lumber, composite, PVC,Trex, Ipe, cedar, Cumaru, redwood, Azek, Fiberon, and other low-maintenance materials. The material you choose couples with the design to produce the product of your dreams.Supreme Deck, Inc. has created three specific choices to help homeowners narrow down your deck building project. We allow YOU to choose the level of service you would like; choose from Builder Series decks, custom decks, and composite deck packages. The Village of Lake Orion was served by trains on the Michigan Central Railroad from 1872 to 1976, and the Detroit United Railway interurban system from 1899 to 1931. Each service had its own track and depot, although both were named “Orion” and located in the village near the intersection of M-24 and Flint Street. Lake Orion also had a flag stop, Rudds Station, on the MCC line east of the village near Clarkston and Kern Roads. Rudds Station served Rudds Mill, a milling operation on Paint Creek that produced wheat for the region. The MCR line ran from Detroit to Mackinaw City, and the Flint Division of the DUR line ran from Royal Oak to Flint. With the increased popularity of the automobile and the paving of M-24 in 1929, passenger service on the DUR was ended in 1931, and track was scrapped during the 1940s for a World War II metal drive and little remains of the corridor. The MCR line maintained passenger service until 1950, and freight service continued until the 1970s. The ownership of the MCC track passed through New York Central and Penn Central and operated until 1976, when it was closed after acquisition by Conrail. The original MCR rails and track east of M-24 were completely removed, and the line from the village southward towards Rochester, Michigan now serves as the recreational Paint Creek Trail. The line from the village northward to Oxford exists now only as a narrow path, but still passes over the historic Indian Lake Road Stone Arch Bridge, a small limestone bridge that was constructed over Indian Lake Road in 1891. Lake Orion was also served by trains on the Grand Trunk Western Railroad “Polly Ann” line, which ran from Pontiac, Michigan to Caseville, Michigan, passing through the western half of Orion Township. Two flag stop stations served Lake Orion on the Polly Ann line. Eames Station was located near the intersection of Joslyn and Silverbell Roads, and Cole Station was near the intersection of Joslyn and Clarkston Roads. A short section of the track is still in use as of 2014, operated by Canadian National Railway specifically to connect the General Motors Orion Assembly plant with the CN main line in Pontiac. However, all track north of Orion Assembly was eliminated and eventually removed by 1985. In 1993, a Rails To Trails federal grant was awarded and matched by the Michigan DNR providing more than $728,000 to purchase the right-of-way from Grand Trunk. The corridor now serves as the recreational Polly Ann Trail, connecting Lake Orion with Oxford, Addison Township, and the Village of Leonard. Crafted with excellence and completely custom, this is the product which is the evidence of your dreams realized. The options and design choices for your deck building project are endless. Each project is fully custom built around you and your home. The way you intend to use this deck is imperative during the design process. Do you entertain a lot? Will you need lighting to invite the crowds from indoors to meander outdoors and extend the leisurely enjoyment? Do you enjoy multi-tiered decks or a big expanse of space at a single level? Will you need shade during certain parts of the day? And truly custom to YOU, do you prefer to mix natural elements with low-maintenance options? All these questions will help yield a deck design that will be certain to satisfy you. Call us to start your dream. 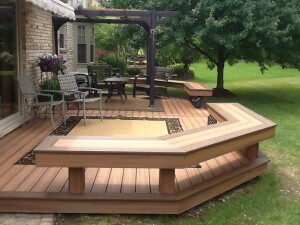 We build great decks for less than our competition in Lake Orion. As I write this blog we are in dead of summer in Orion Township. As a deck builder we often get asked about the temperature of decks. This used to not be as much of a concern because when I started out in the deck business we were primarily using pressure-treated lumber. A lot has changed in the last 26 years. 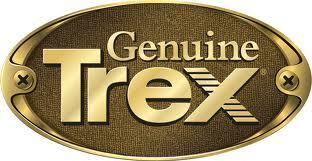 We are now installing more manufactured (composite decking) products than we are wood type decking products. Considering their many benefits; low-maintenance, no splinters, no cupping, no staining, and now, minimal color fade, it’s no surprise that this is a growing trend. There is one characteristic where wood does perform better, and that is it does not get as hot. The majority of the man-made products do get hotter than their wood counterparts. First, consider how much barefoot traffic you might encounter. Around pools there will be much more barefoot traffic than on a front entrance. Consider shade and direct sun. Also, what time of day you will be using it? How will the sun be positioned? Keep in mind that lighter colors will not get as hot as darker colors. We recommend lighter colored decking around pools. Think about the type of decking you are selecting. Different plastic compositions will hold a different amount of heat. You will find that different brands of decking will differ in their heat gain. If possible, take samples of the products you are considering using and place them outside on the area and try them out. This will only work if you are planning your project in the summer but it will give you a real life test drive of the products and colors. Let’s face it. When it’s 92 degrees Fahrenheit outside, everything is hot. You are not going to be hanging out in full sun anywhere if you can help it. In Northeast Ohio, this problem of being too hot only lasts for a couple short months, the rest of the time you will welcome the little bit of extra heat a low-maintenance product might hold. Finally prioritize your decking characteristics. Is heat retention your number one concern? Most of our clients want the benefits of low-maintenance, and no splinters, over a few degrees of heat retention. Even around swimming pools, splinters are as much of a concern as is heat retention. Our approach is to arm you with the information that you need. Then you make the call, it’s your deck. Let us know if you would like our advice.